The Ministry of Defense of the Russian Federation organized the Seventh Conference on International Security, which was held in Moscow on 4-5 of April 2018. This year the Conference focused on the defeat of terrorists in Syria. The Russian side shared its experience on combating ISIL and provided estimates on further development of the situation in the Middle East, including post-conflict rehabilitation. Security issues facing Europe, Asia, Africa and Latin America were also in the spotlight of the forum. Special session addressed “Soft power” phenomenon as a tool to pursue military-political objectives. The Conference participants enjoyed familiarization tour of the Military-patriotic recreation park of the Armed Forces of the Russian Federation “Patriot” (Kubinka, Moscow Region). Bahrain’s Defense Affairs Minister, Lt-General Yusuf bin Ahmed Al Jalahma (photo), met Russian Defense Minister General Sergei Shoigu, on the sidelines of the Conference, Bahrain News Agency (BNA) reported. 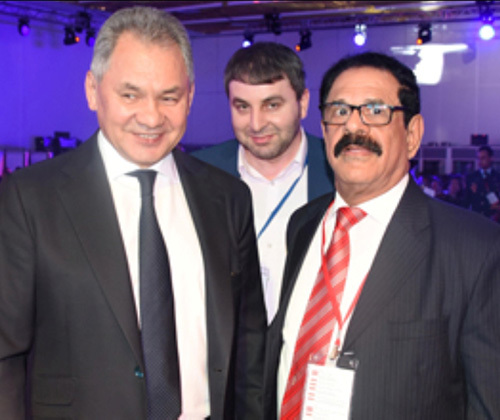 Lt-General Al Jalahma expressed appreciation of the Russian invitation to the event. He highlighted Bahrain’s commitment to continue working with the international efforts to counter all forms of terrorism and extremism. General Shoigu hailed the royal reforms, wishing Bahrain further progress and prosperity. “For us, the host agency, it is truly rewarding to note the growing tangibility in the outputs from Moscow Conference discussions. We seek to achieve the common goal through finding mutually acceptable solutions to the most pressing issues of international security with due regard for each and everyone’s interests. Conference proceedings as well as speakers’ statements published in the outcome will be thoroughly analyzed and thereafter applied by national government and think tank agencies,” he added. “Today, to our regret we witness escalating tensions both globally and regionally, we indicate attempts to use power factor to secure vested interests. In order to counter these negative trends as well as to cope with the most eminent security threats, the Defense Ministry of the Russian Federation offers an opportunity to discuss effort consolidation among the world community and the militaries across the globe. We hope to retain practical delivery and ensure effectiveness of the follow-up Conference by focusing its plenary sessions and subject matter panels upon the most acute threats and challenges facing global and regional security,” Shoigu concluded.